The rain here has given way to snow, and while that’s the absolute death of autumn, I find it infinitely more cheerful. Snow you can at least brush off, or shovel up, or look at. Snow doesn’t leak into the basement. Snow makes me think that Christmas is coming (it is) and puts me in a fine mood to organize and buy a tree and make lists and start figuring out who gets what, and maybe even bake cookies. Snow makes me want to go for long walks in the evening so I can look at it sparkle. Snow at its very least, is pretty. 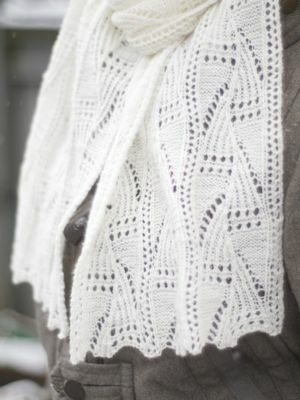 This snowy day is a good day to show you the finished Fernfrost, knit out of my precious laceweight cormo from Foxhill. 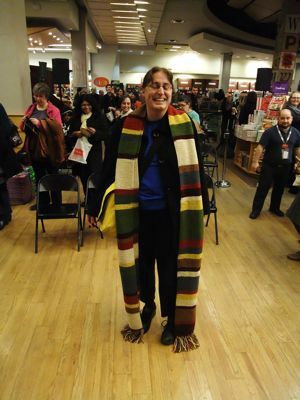 Mercy, but I do love this scarf, it’s long and gorgeous. In the interest of full disclosure, that’s the only change I made to the pattern. Anne calls for 11 repeats, and I did 17, because the cormo is so soft that I wanted it to be able to wrap it. This wonderful thing was intended to be a Christmas gift, but I think I might have made a mistake. I knew I was attached to that cormo yarn, I knew I’ve been looking forward to knitting it, I knew that I would love anything that I made out of it, but I’m really good at giving knitting away. You can’t knit this much and not be good at giving knitting away… so I thought that somehow, I’d be able to let go of this. 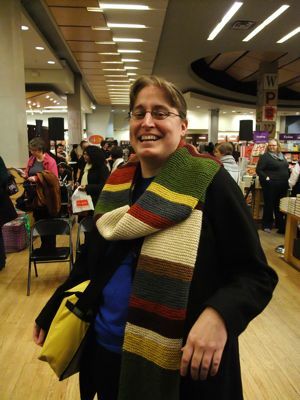 The whole time I’ve been knitting it, I’ve been thinking that it was going to take some personal resolve to give it, but I believed as long as I was making it for someone I really loved, who I thought would really adore the scarf, that everything would work out fine. Now that it’s done it’s so absolutely delicious I find my generosity is failing me. This scarf makes me want to walk straight to The Bay where I’m sure I could get a very nice commercial scarf that would make the intended recipient very happy. It’s not like they would ever even know that this was supposed to be for them. If I kept this (and to do that, I would have to get it off Natalie first, which might be a little bit tricky) I would have to reconcile myself to the fact that every time I wear it, someone in the family is going to look at me like I stole their Christmas present. I might be okay with that. PS. Every time I use Natalie as a model, someone asks me about her woollies. I am finally thinking ahead enough to be able to tell you. 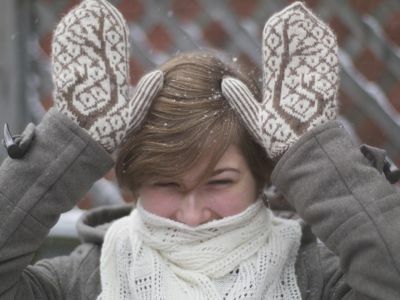 Natalie’s mittens are her Oh Deer! pattern, and Yes. They are antlers disguised as mittens. Yes, that is ridiculously cute. Yes. PPS. Speaking of Natalie, she’s working on rounding out my teaching/speaking schedule for next year. If you were hoping I would be able to come and teach/speak at your shop or guild, now’s the time to email her. 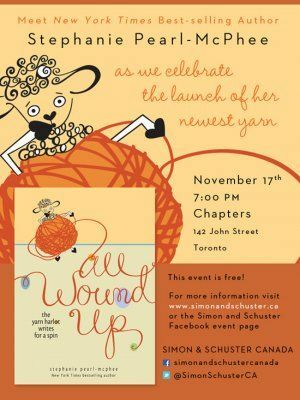 She can be reached at Natalie@yarnharlot.ca. Somewhere, as you read this, I am trudging through the rain and cold, on my way to a meeting I don’t want to be at, or I have left the meeting, and am standing at a bus stop, as annoyed as you can imagine that it’s raining on me. I think that the friend who told me that I must have been a cat in a previous life was right, because I hate water falling on me. It makes me instantly crabby when there are spots of water on my glasses, and when the rain starts to soak your winter coat, because that garment is built for snow, not rain, and somewhere, I am bloody indignant that it’s cold enough that I have to wear a winter coat, but still raining. Rain, I am thinking, as I stand wherever I am, is miserable. Somewhere, as you read this, I am contemplating that while I hate all rain, I have a spectacular loathing for early winter rain, and how cold it is, and how today is dark and grumpy and miserable, exactly the sort of day that I like to spend in the house, with soup, writing, knitting and a cup of tea. Somewhere, as you read this, I’m pretending that the 40 minutes that I was home at noontime, in between things to do, is what my whole day was like. 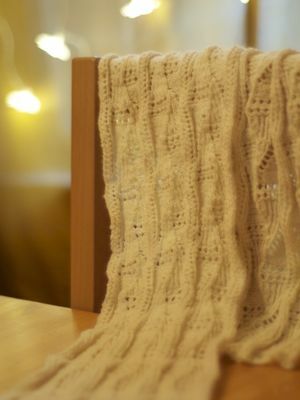 I am pretending that instead of (insert miserable damp cold errand here) I am at home, blocking my finished Fernfrost. Fernfrost is shown unblocked, here in my cozy house, where rain is not falling. 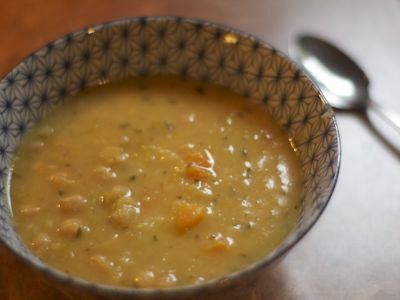 Somewhere, standing in the rain, feeling it soak through the pockets of my coat and through my wool hat, I am thinking about this soup, which I knocked together in 30 of the 40 minutes I was home, and then ate as fortification against the rain. At the 10 minute mark, add the potatoes and carrots, and maybe turn the heat up a little. Stir, cooking until they’re almost tender, then whack in the garlic, and stir for about 2 more minutes. Add the stock and parsley (if you’re using it) and bring the soup to a simmer. I serve it with warm bread and pretend it isn’t raining pouring. 1. I didn’t meet Prince, but it was a fabulous concert, and my sister Erin can vouch for the fact that he did smile at me. I smiled back. It might be that our relationship doesn’t really blossom into anything more than that. 2. 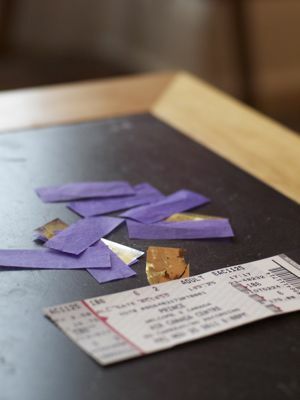 I did bring home a handful of the purple confetti that fell during Purple Rain. 3. No. I don’t think that’s dorky. 4. I have no mittens. I’ve been wearing these beautiful Latvian ones for years and one of them is finally no more. I could make myself a beautiful pair to replace the ones that are gone, or I could knock off a quick and dirty pair, turn my attention to the Christmas knitting and come back to the mitten dilemma after the 25th. I can’t decide. I did a deep, fulfilling sort of cleaning. I mean to do this every year at the beginning of the winter season, since it’s such a crazy and busy time, and everyone is going to be trapped in this house until May- but I never get to it. 6. Today I think I’m going to finish Fernfrost. I’ve thought I was done every day for 4 days, but then every day I decided not to skimp and add another repeat. Today is looking good though. 7. If I can bring myself to do it, today I’m going to start the Christmas shopping. I have this crazy idea where if I actually do a little at a time, maybe it won’t be so painful. Still, starting now seems rash. It’s like admitting that it’s really happening, which it is, so maybe that’s best. I don’t know. This time of year really throws me off. 8. Maybe I’ll just make mittens. Joe has been out of town this week, and I keep trying to think of all the really great things that I should be doing, since I’m unencumbered by marital responsibility, and I swear that despite my best efforts, I can’t come up with anything that I really want to do that I can’t usually do because he’s here. The best I’ve done is that I’ve eaten two things he doesn’t care for (it probably isn’t worth mentioning that I don’t really care for them either, I was just making a point) watched a movie that had no explosions in it, and have slept diagonally in our bed just because I can. These activities have been less fulfilling than expected. In my secret heart, I believe that the only thing standing between Prince, me and a lifetime of happiness together is that we’ve never physically met – in the real world. (My secret heart also believes several other things, like that we could totally overcome our religious differences, and that the fact that I’m 5’1" and he’s 5’2" has always been the strongest indicator of this truth.) Seven years ago, the last time that Prince and I were together, I realized a bunch of stuff about our relationship, not the least of which was that while both he and I realize that our life paths are taking us in different directions, I had the shocking discovery that despite being a loyal wife to a wonderful man, and despite being the slightly dumpy mother of three near adult women… I would still totally sleep with Prince if he asked me. 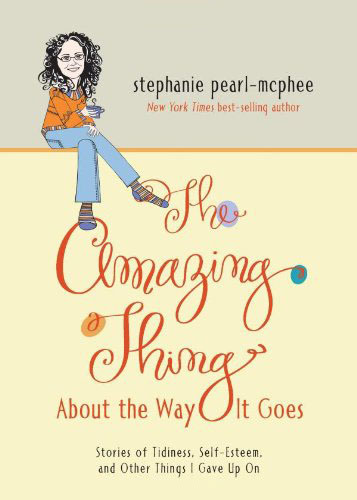 This morning my sister and I were discussing just that, and I said that I knew that it was a little ethically disappointing to discover that was still true. That no matter how freaky the king of funk gets, I just keep on wanting him. That if I had the chance (and were that chance now not biologically past me) that I would bear him as many tiny little babies as he wanted. (There has never been any doubt in my mind that the products of our union would be vertically challenged. Neither Prince nor I am bringing much to the table there.) Erin sighed, and asked me what I was planning on wearing. (She has a really great outfit planned, which makes me wonder about the sense of bringing your better looking, well dressed younger sister to your rendezvous with your soul-mate) and I said that I was just going to wear jeans and a tee shirt, because if Prince cares what I’m wearing, he’s not the man I thought he was. (Ditto for the unshaved armpits. I don’t care if he man-scapes his. Our love is perfect and oblivious.) I’m going to be me, and he’s going to be him and all will be as the universe has ordained. When I got off the phone with Erin I decided that maybe I would at least where a clean tee-shirt. I bet Prince would appreciate that effort, and that’s when the phone rang, and it was Joe, calling home. He asked what I was doing, and I said that I was getting ready for Prince, and he chuckled, and told me to have a great time, and I said "You do know Joe, that I am going to sleep with him if I get the chance?" and Joe said "I know baby, I know you would." and we laughed for a few minutes and discussed the free pass Joe would have, would Parker Posey only knock on our front door looking for him, and we hung up. The thing is, that when I got off the phone, I realized that I’m really only sort of kidding, and right now, I’m sitting here drinking coffee, and realizing that there’s only one redeeming thing about the very real truth that I would sleep with Prince if he asked me. He does have to ask. I’m not a hussy. A little while ago, the weather here made that mysterious leap from autumn to early winter, and all of a sudden I can’t get warm. The house can’t get warm, it’s like the heat won’t sink in to it and nothing is cozy. I feel like the light of autumn is golden and warm, and then there’s this shift, and the trees are bare, and the light (what little of it there is) seems thin and blue. This phase passes. It’s a temporary thing, like everyone walking around right now when it’s -1 and saying "It’s so cold out". Come January you’re dreaming of -1, and by March you think that temp is a sign of spring. What seems like the cruelty of early winter will give way soon to deep winter, with snow, darkness and storms outside, and candles, sparkles and coziness in the house. You just have to get over the soul crushing hump of accepting another winter, let your inner thermostat remember how to deal with it. For the moment, I am in phase one. Huddled under comforters, complaining about the cold, taking long hot baths to try and warm my cold hands and feet, making soup, lighting candles for the meagre glow… and knitting extra warm wool socks. These socks are perfect. Whenever I’m cold I always think I should knit something. It’s a knitter affliction. Instead of thinking "I should get a sweater" our first response is casting one on, as though that would help fast enough. Usually the sweater I cast on to cope with January is finished in June, and that hardly seems helpful, but these bad boys? Cast on 48 hours ago, and warming my feel last night. Instant socks. 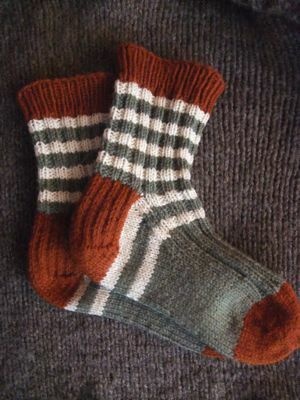 The yarn is from Solitude Wool, and it’s a kit they call the Dorset Boot Socks. (Solitude makes beautiful breed specific yarns.) I bought it at Vogue Knitting last January, but it’s been hanging out until the other night when my cold feet and the desperation of early winter prompted me to cast on. They worked up fast on 3.25mm needles, and I had the first one what seemed like minutes after I thought that I would knit them. In reality, it was more like a couple of hours, but that’s it. As close to instant socks as I’m going to get. The yarn is yummy and robust, with nice crimp and bounce, and not really what you would call soft, but not scratchy in any way either. Just warm, real wool, thick and proper – like a bowl of oatmeal. 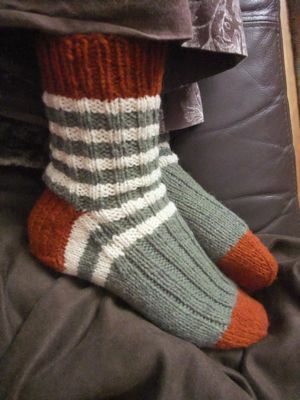 These socks are so satisfying that it makes me want to order a bunch of those kits and lay them away like fortification against anything winter brings. I’m still a little cold. Maybe I should make a hat. There is a baby coming in our family. It’s been a while since we had one, so excitement is running high. Hank’s getting really big, and all other grand-children are old enough to vote in the next election, so this baby is going to be a very over-cherished wee thing. Joe’s sister Katie (and I suppose her Carlos contributed a single cell, so should be mentioned) is going to give us a baby sometime in February (or early March, I don’t want to rush her at all) and I am getting ready. Katie is very, very nice, and I’m assuming the baby will be too, which means that the two of them together (and Carlos, he’s nice too) are entitled to all the best knits that can fly off these needles between now and then. The thing is that I am pretty well acquainted with how long it takes to make a baby. I also know that as a knitter, I shouldn’t even be a little concerned about that baby until after the Christmas knitting is done. (Yeah, I said it. It’s time for the Christmas knitting. Live with it. We all knew it was coming.) 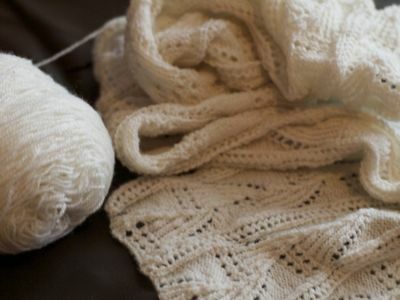 I flirted with the idea of the baby knitting, but really I had it in my head that I had just buckets of time before I had to worry about it, and then it happened. A baby shower invitation arrived in the mail, and faster than you could say "holy booties Batman, I thought I had three months" I needed a baby gift. 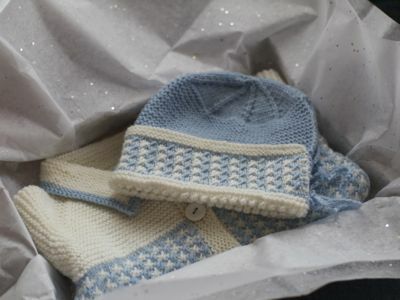 Naturally, this prompted a deep dive into the pattern stash, and I came out with Baby Knits from Dale of Norway: Soft Treasures for Little Ones , which was floating sort of close to the top of the pile. (Yes, by the way, that book is out of print and yes, that means it’s expensive. I promise it wasn’t when I bought it. I bet you can get it from the library if you really need to see it.) I love just about everything in that book, and since I was leaving for Port Ludlow, and couldn’t really get into it, I just tossed that book and four balls of Baby Ull into my suitcase. I figured I could work the rest out later. I did. The day after the Colour Retreat, I cast on Perlemor, and away I went. 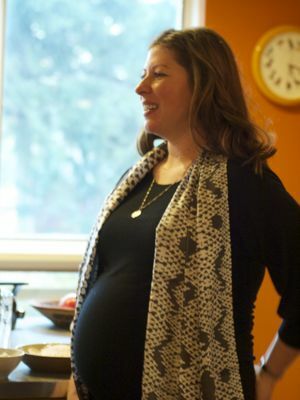 For the most part, the thing proceeded without any sort of upset or difficulty until I entered some sort of fugue state on Friday night when I realized that the baby shower was SUNDAY, and had a freakout the size of Chicago, which is not at all insignificant. 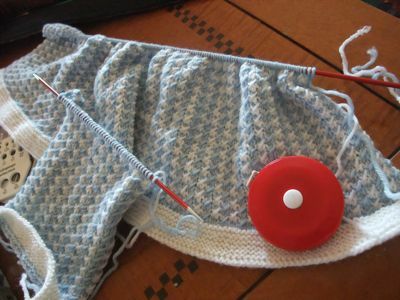 Still, I held it together until Saturday night, when the sweater was done and blocking, and I only had the bonnet to go, and I realized that the bonnet had a turned back brim that was going to add an extra six centimetres of length to that mission, and promptly cast on, knit seven rows and then went to be completely demoralized. I am nothing, however, if not delusional determined, and so Sunday morning I got it into my head that I could totally nail it. After all (I argued with myself) the shower isn’t until 2:00. Who can’t knit a bonnet in five hours? I made coffee, and applied myself to the mission, and at 1:45 I was steam blocking the wee thing, wrapping it, and heading out the door. and I think she likes it. I can’t wait for this baby. PS. 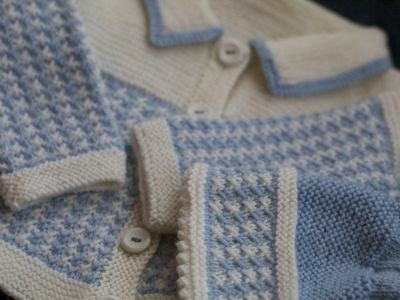 I have already explained this to Katie and Carlos, but the fact that I have knit a blue and white baby sweater is no way a statement or endorsement of the idea of them having a boy. I understand there’s just about a 50% chance that there’s a wonderful little nephew in there (who I will adore completely and wholly, as I do Hank) but my preference for girl babies is well known. That’s what I want. I just happen to think that babies of all varieties look nice in blue and think dressing them according to what’s under the diaper is silly. That’s it. PPS. 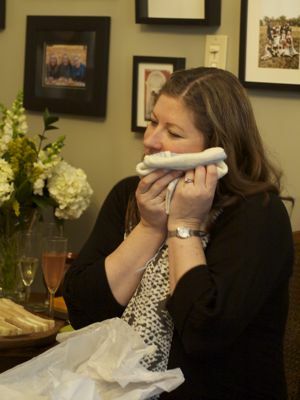 We also gave Katie our favourite baby gift. Feel free to steal this idea, it’s one of the best we’ve ever had. I went to the bookstore and bought the first book each of us can remember. For Joe it’s Curious George , for me, Hand, Hand, Fingers, Thumb , for Amanda it’s Green Eggs and Ham , Megan remembers Very Hungry Caterpillar and Sam fondly recalls Murmel, Murmel, Murmel . Winners all. Thursday night was pretty great, and I meant to write about it first thing on Friday morning, but I think that I procrastinated on some of my exhaustion, and so I woke up, realized the book events were good and over, and was promptly overcome with the urge to lie down. When that passed I found I was really in the weeds on a baby shower deadline, and had to do a serious who-do on the space time continuum to get it done in time for yesterday. I’ll show you that tomorrow. I know I’m not blogging enough when the unblogged knits start piling up- and they are. 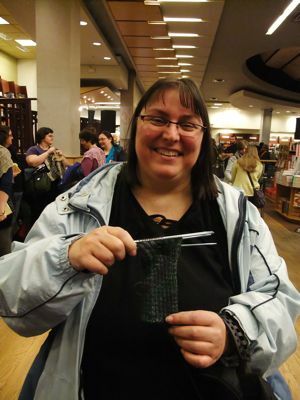 There’s socks and a sweater and I spun some yarn and they all deserve a blog post, so this week I’m going to try and be really good and catch up. For starters though, I’m going to pretend that today is Friday, and then tomorrow can be today, and the day after that I’ll try to make it a two in one. Or something. In any case: I showed up for the Toronto event ready and raring to go- if by raring to go, you understand that I’d checked real estate listings for where else I could live, then headed downtown. I always worry about the local events. My reasoning is that I don’t really need to worry about screwing up in other cities. If I screw up in Baltimore and do a whole event with my fly open (for example) I can simply – should I find the humiliation a little too much, never go back to Baltimore. If I screw up here, I have to move, as well as endure a retelling of whatever I did to humiliate myself every holiday from then on, since my whole family will have witnessed it. If you’re me, that’s enough to make you supremely nervous, and I was. I checked my fly about a million times, then stepped up to get it done. Hello Toronto! 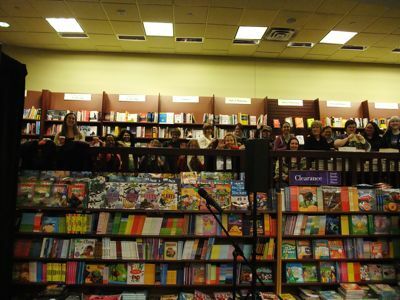 The bookstore had about 35 chairs, and we had considerably more knitters than that, but I think the Toronto knitters actually enjoy smashing bookstore expectations, so all seemed well. I read, rather nervously, since every time I looked up I saw my family. When it was over, the real fun started. 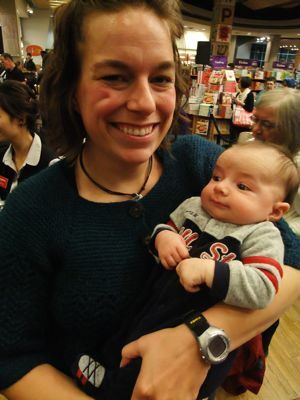 I got to see a a baby – this is Megan and the charming Miles. 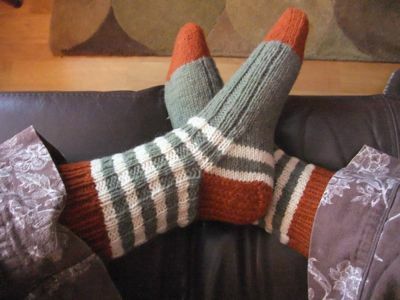 There were first sock knitters, like Rayna and Ellen. 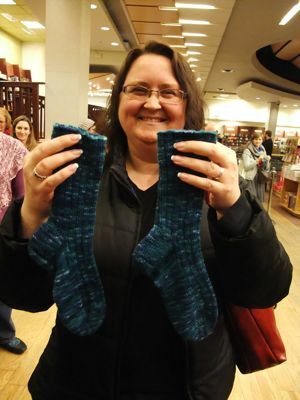 And then there were first sock knitters not like Rayna and Ellen – Like Juli, who explained that these socks are her first started pair of socks, and her first finished pair of socks. …Or like Ann, who just stepped up and held up her socks, and I said "Oh wow! First socks?" and she said "Nope". The honesty of it cracked me right up. 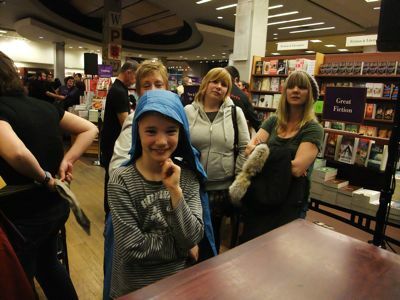 There was my Mum and my Sister and My daughter and Hank. I don’t know why Mum, Erin and Amanda look so bored there. I swear they looked enthusiastic two seconds before. Probably an immediate knee-jerk response to me taking out my camera and saying something about the blog. which considering that it’s an authentic length, says something good about her stick-to-it-iveness. This is Heather, who was out celebrating two years since her bone marrow transplant – and considering that she’s alive, that says something about her stick-to-it-iveness as well. 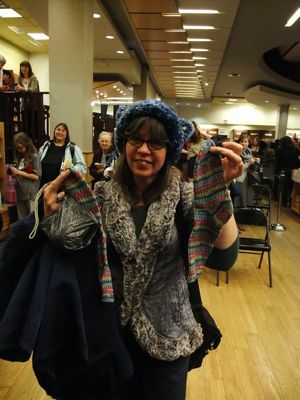 Meet Emily, who’s a brand new knitter, and obviously destined for greatness. 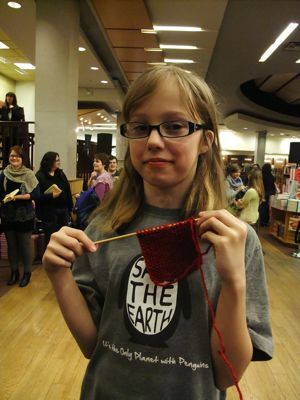 I don’t know if it’s the glasses or the knitting, but she reminded me of me at that age. Lovely girl. 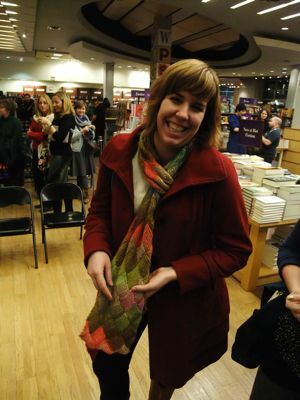 This is Stephanie and her first scarf – which is Entrelac of course. I shrieked "KEENER" at her in the most affectionate way possible. I think she understood. 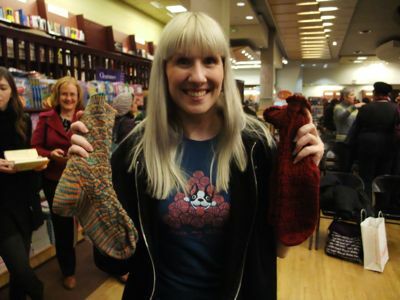 Also in that category was Jen, who showed off her first and second pair of mittens. 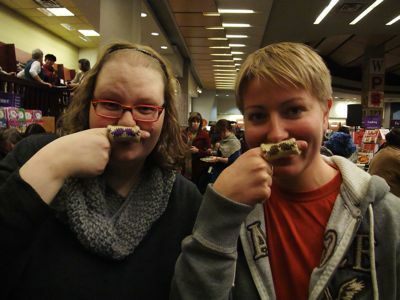 Emily and Morgan did their knitterly part for Movember. Just to round it out – Look! That’s Martha and Glenna, in the same place at the same time. They’re knitting twins, and for the longest time Glenna used to come to knit night. I knew her, liked her, we’re sort of friends, and then Glenna moved and stopped coming, but this person who looks, sounds and knits exactly like her started showing up. For the longest time I didn’t know who Martha was, just that she was not quite Glenna, and after that for a long time, I sort of that that Glenna was just screwing with me. That she didn’t really have a twin sister, she just liked to pretend she didn’t know me some weeks, and to pull that off she called herself "Martha". Turns out they really are two people. Who knew? 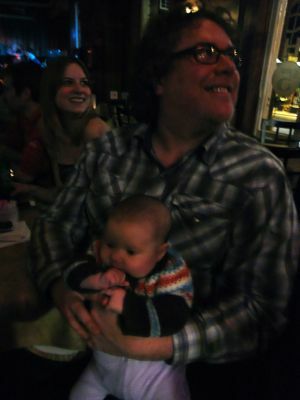 We rounded the evening out by heading over to a pub (two really, but that’s another story) and while we were there, Joe held baby Marlowe. ‘s sweet. It was a lovely bit of icing on my evening’s cake. 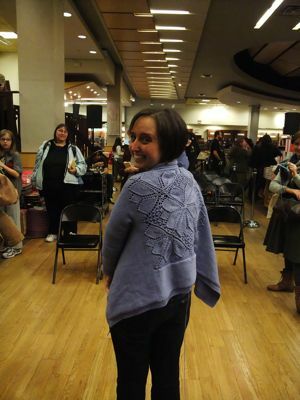 Thanks Toronto knitters, I love you guys, and I’m so glad I don’t have to move. I’ve been thinking a lot about the event for tomorrow night here in Toronto, and the way that the last few weeks feel desperately out of order. It says "Launch" and while that’s technically correct, having just been signing and touring this book for a month, it seems weird to be launching it after it seems… well. Launched. 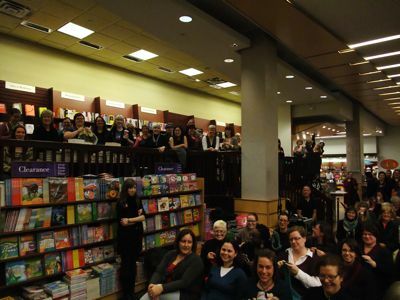 I was talking about it with Joe and he pointed out that it wasn’t ever really launched here in Canada, and it is the first Canadian event, and that the book’s already been on the New York Times Bestseller list – and he’d like to celebrate that, and that frankly, even if it hadn’t been on the list, he would still be pretty freaking proud that I wrote another book, and that he appreciates the night to feel good about that accomplishment, and he wishes I would too. It’s not that I don’t feel proud either – I feel nervous and worried. The hometown crowd always freaks me out. Canadians are a proud and restrained people and the enthusiasm we hold for our own, while fierce, is sort of quiet, and we don’t like to tell our artists too much that they’re awesome, and we certainly don’t want them to tell us. It is important to us that they’re still regular Canadians, and we’ll like… maybe see them at the pub or something. It’s hard to explain, but when you contrast American and Canadian public enthusiasm, it makes total sense which culture invented cheerleading, and why most Canadians have a certain ennui for publicity stunts or gigs. (This does not apply to hockey or The Hip.) This is a strange thing if you’re expected to promote a book in Canada – because publicity is inherently the opposite of what we think is in good taste, unless you’re going on Q – which I’m not. This leaves me worried that an event in Toronto might be… rude? Inconvenient? Over-reaching? In the past I’ve made up for this by making sure that there was value added. You know, it wasn’t just me – I didn’t expect anyone to turn up for me, so I did scavenger hunts and had the musical opening acts and essentially, tried to make sure that it was worth it for people to come, because really, I’m not worth it by myself, which sounds like I have really low self-esteem, but it’s not that, it’s that publicity is just so damned AWKWARD. This time, I didn’t know what to do, so let’s just do it the way we do it. 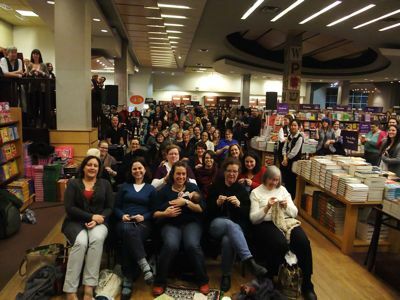 I’ll talk and read you some stories, while you guys freak out a whole downtown bookstore by knitting en masse, then we’ll go for a pint. 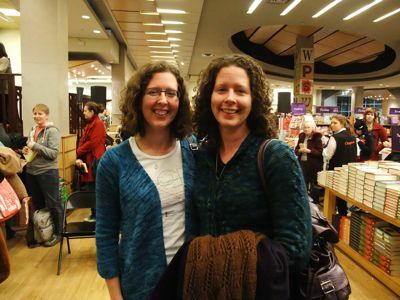 To make sure that we’re still us, Natalie and Rachel H will be ready to accept donations for MSF (the Toronto office was sweet enough to send me a card congratulating me on the NYT bestseller list) see one of them, and we’ll see what we can do to spread the knitter goodness around. Donations accepted at both spots. Dress casual. Knitting not required, but makes a lot of sense. PS. The Old York is my sister’s pub. PPS. I’d love to know if you’re coming. PPPS. I finished some socks. At the end of a retreat, I always feel lucky. It’s not hard to – while the hours are long and it’s absolutely a lot of work, it’s amazing work, in an amazing spot with a chef. There’s no way you can pretend that you’re hard done by if this is your job. There’s only one thing I ever wish, and I know other teachers/organizers feel the same pang – we’re in this industry because we love the fibre arts, but there’s not a lot of time to play and share between us. We always think that we’d like to take each others classes, but it doesn’t happen. There’s never time or money or all that. This trip though, this trip Tina, Judith and I had an idea, and once that idea was in the hands of ST-2 Lisa (one of the worlds most effective and efficient women) it actually became a plan. We talked a little about things we’d like to know – and do, and voila. After leaving Port Ludlow Friday, we stopped at a grocery store, picked up all that we needed to sustain life for a few days, and then went to Tina’s – where a few hours later, Lisa and Judith arrived, with a car full of fun. 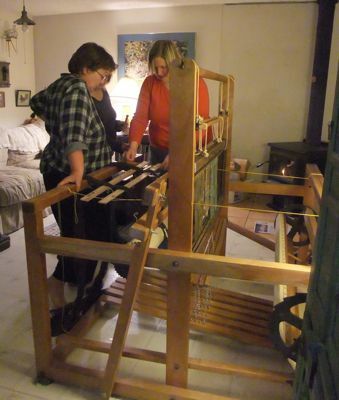 A loom. A big floor loom. 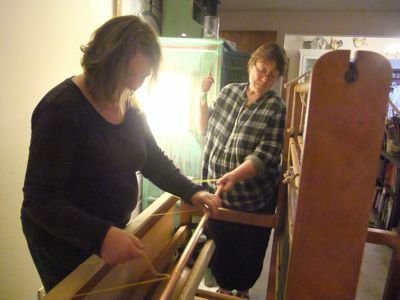 A loom with intentions my friends, and over the course of the next day, we put together that jigsaw of a beast, and got it warped and ready to weave, and if the world is the way it should be today, then yesterday after I left, Tina and Judith and Lisa were getting Tina started on rug weaving. It was amazing. It came in through the door in about 30 pieces, and then it was up to us (Okay, Judith and Lisa – Tina and I have all the experience of fleas, compared to those two) to figure out what parts went together how. It was this crazy scene. We’d line up some parts that looked like they would go together, and then Judith would say something like "This is wrong. In all my years I’ve never seen that brake go there" and we’d take it all apart and put it together another way, until someone would say "Ahh… yes. 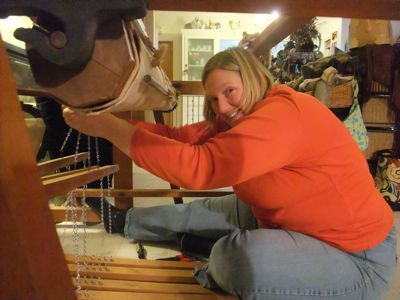 Look – that’s how it goes" and assembled a whole loom that way, with no idea what sort of loom it was, or anything. It was a complete reliance on the knowledge of how it had to work, if it was going to work – and piecing it together from there. 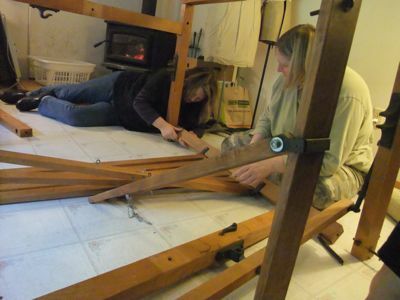 I think I need a floor loom – a smaller one. I’m ready. Maybe a used Baby wolf. I’m going to start looking. 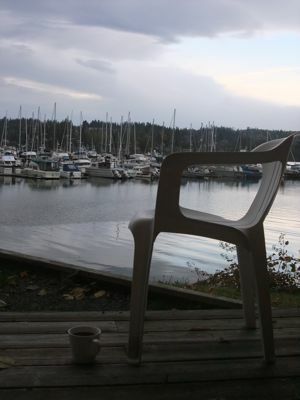 This is my last morning at Port Ludlow. Today Tina and I move from here to her house, where we’ll do a bit of work, then enjoy a quick weaving lesson. (Mostly the weaving lesson is for her. I’ll be without a loom, but will listen carefully.) On Sunday I fly home, to a busy week (I have an event in Toronto on Thursday that should be a good time, you’re all invited) but one at home, and I’m really looking forward to it. My bed, my home, my husband, my girls. Can’t wait. I feel like I’ve been away for a month. (Oh wait. I have been.) Still, as much as I love home, there’s no reason not to enjoy where I am now, and so this morning I got up, took my coffee out the the deck and sat quietly, watching a very red sunrise and trying to remember that rhyme. I think it’s "Red sky at night, sailors delight, red sky in morning, sailors take warning"- and I wondered what that meant for the weather today. It was so still, and so perfect, and a little cold, so I gave a sympathetic nod to a few ducks who didn’t care, and came back inside. Now as I sit here, writing to you and knitting with my second cup of coffee, I see that this is one of those days when the planet tries to answer questions directly. Does a red sky in the morning mean foul weather is coming? Yes, at least today. The wind has come up, the clouds are racing, the temperature dropping, and mysteriously, the ducks have found a place to disappear to. 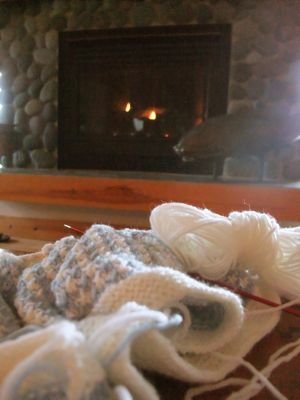 The wind is howling outside, making the house tremble a little, and the trees bang on the windows and I’m happy for the fire, a cup of coffee and the little sweater I’m making that’s coming along so well. It’s Perlemor – from one of my favourite books, Soft Treasures for Little Ones . (It’s true. I love almost everything in that one, although I think it’s out of print, so your best bet might be the library if you’re interested.) 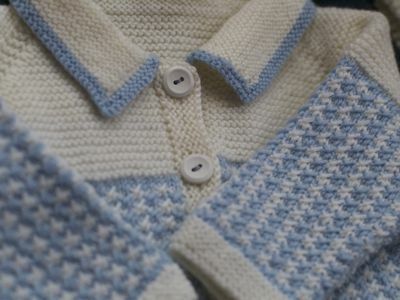 Knit out of soft and beautiful Dale of Norway Baby Ull. Such a nice yarn. Such a nice pattern. It’s just about perfect here right this minute, all alone – with the fire and my knitting cozy inside, and the wind raging and flinging leaves around outside. I can hear it howling, and I know today the sailors should have taken warning, and if I had my way? We have got to get busy on that teleporter.